It looks like SpaceX performed a more aggressive boostback burn, almost a boostdown, during the SAOCOM-1A mission. Here’s my analysis of the mission, using pre/post-launch FlightClub data, SpaceX webcast information, and my on-site photos. What is FlightClub, you ask? FlightClub is an orbital launch simulator built by Declan Murphy to help visualize rocket trajectories for various purposes. I use it (among other launch photographers) to help plan out my long exposure photos of rockets climbing to orbit. So pre-launch, I head over to the site and see what things look like as I start to hone in on my creative ideas. Technicalities: a Canon EF-S 10-22mm lens on a APS-C sized crop-sensor camera oriented horizontally. My goal with the project was to capture launch, boostback (boostdown? ), reentry, 2nd stage, and landing burn all in one exposure. No edits, stacking, compositing, ‘photos shot seconds apart’ – none of that. Just straight up, back-to-the-basics long exposure photography. Press the button, let the camera record the light, and stop it after landing. From my viewing location I could observe the rocket directly, so this made framing the shot quite easy. The Falcon 9 rocket is located at the tip of the arrow. What’s really interesting about this launch is that it was more of a boostdown than a boostback. It looks like Falcon 9’s first stage flew (mostly) vertically for longer, didn’t give the second stage much horizontal velocity, and the boost back burn sent first stage, at it’s apogee, higher than I expected but did not travel as far downrange as other SpaceX RTLS profiles. Well, usually when you hear “Stage 1 has entered its flip” on the webcast, it turns from the direction of its velocity vector (pointing upward and downrange, consider this up and to the left) and boosts back in the opposite direction at 0° (horizontal, to the right) or -5° (engines up and interstage slightly down, to the right). SAOCOM-1A’s boostback burn started at -28°, directly retrograde to its velocity. Big change from normal. They really wanted to get the stage back slow and as early as possible. In my research, Falcon 9 first stages usually reach apogees (highest altitude) of ~118-170km on RTLS profiles, SAOCOM-1A did not differ much in this department with an apogee of 134km. What differed here is the downrange distance. Before, the closest a Falcon 9 first stage on an RTLS profile remained to the launch site was 70km. SAOCOM-1A only traveled 59km downrange. 2nd stage really had to perform the brunt of the work on SAOCOM-1A as this was very much a lofted trajectory. After all, 2nd stage did not shutdown until T+10 min 14 seconds. And finally, here is a GIF comparing the post-launch sim and my actual photo. Still some minor differences with the placement of the reentry/landing burns. but for my photographic purposes – FlightClub absolutely nailed these predictions, yet again, allowing me the chance to take this one of a kind long exposure. Normally, the first stage performs its boostback burn and sends it on a trajectory short of land altogether and glides in at the last moments, further bleeding off speed, to the landing zone. With SAOCOM-1A, stage 1 performed minimal gliding using the body of the rocket, and is the reason the simulation’s reentry/landing burns appear closer to the launch streaks. This is why you should support his efforts with FlightClub.. 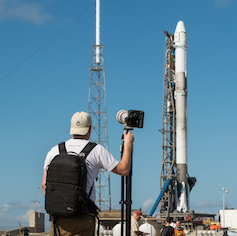 If you want to access these Photographer’s Tools in FlightClub to plan your own launch photos, to support Declan because what he’s doing is really cool, because he aims to do this work full-time, or you (like me) think it’s magic, you can support him here on Patreon. Below, you’ll find a few of my favorite photos from this launch, long exposure and otherwise. If you’d like to know the settings, get a download for your phone/desktop wallpaper, or hang a print – you can find links to those below each respective photo! Until the next launch, keep looking up! Tl;dr: FlightClub did it again!